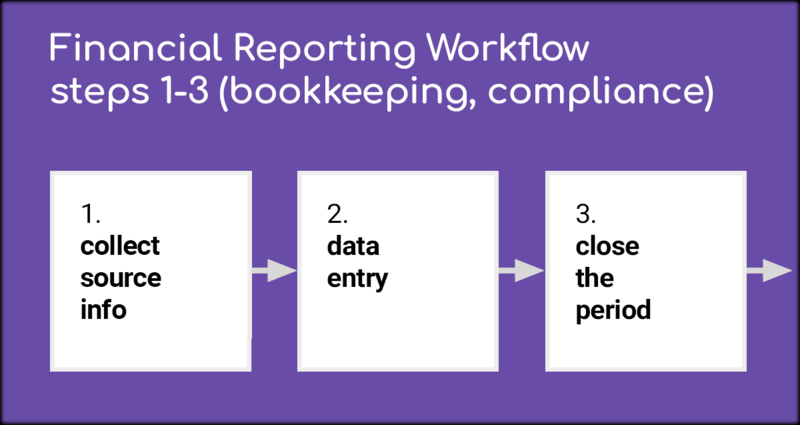 In my last blog I introduced the 6 steps in the financial reporting process. Now I’m going to discuss the first 3 of those and some related problems – and I’ll give a few tips on how to solve them. The first 3 steps form the bookkeeping phase that is required to keep accurate financial records. They are needed to ensure a good quality set of data from which useful management reports can be produced. While the 3 steps are shown in my diagram as a sequence, in most cases they overlap in time. These are the documents that record the financial transactions carried out by the organisation. Things like invoices, credit notes, bank statements, expense claims and receipts. Each transaction entered into the accounting system should be supported by evidence – a document (paper or electronic). It should give details of the transaction that an auditor or tax inspector could check. Problem – Late or missing documents. A couple of weeks into the next period, invoices, expense claims or other documents may arrive, with dates near the end of the previous period. This is very frustrating for a bookkeeper. They may have already closed the previous period and started forecasting and analysis, and that work may have to be re-done. Tip: Be systematic. Set and communicate your deadlines, and explain why they are important. Problem – Incomplete or incorrect documents. Key documents, such as VAT invoices, need to include a lot of information. https://www.revenue.ie/en/vat/vat-records-invoices-and-credit-notes/invoices/what-information-is-required-on-a-vat-invoice.aspx. Many invoices I have received don’t show some of these items! Overseas suppliers of cloud software services often seem to have problems in this area. Tip: Make sure overseas suppliers know your UK VAT number, so they don’t unnecessarily charge VAT. The core data entry tasks are the entry of invoices and payments from or to customers, suppliers and employees. Some organisations are now automating many of these entries, using apps, integrations or custom code. The manual entry of transactions is helped by the automatic daily bank feed that can be set up in accounting systems like Xero. That allows frequent bank account reconciliation. This can prompt a bookkeeper to enter not only payments and receipts, but also the invoices they relate to. Problem – Finding the right account. It is vital, when an invoice is entered in the accounts, that each line item has the correct nominal ledger account selected. If the account choice is incorrect then the transactions may appear in the wrong sections of reports, which would mislead people. Tip: For each customer and supplier contact in Xero, set the default account and VAT rate option. When you create an invoice for that organisation these choices will be shown by default. Problem – VAT status. The bookkeeper of a VAT registered business needs to pick the correct VAT Rate for each line item in every invoice created. This is necessary to generate accurate VAT returns. Several of the VAT rate options are very similar, such as ‘No VAT’, ‘Exempt’ and ‘Zero Rated’. ‘Reverse Charge Expenses’ is another confusing rate that often has to be applied to invoices from overseas suppliers of services. But the invoice may not show that this needs to be done. These activities are needed to check accuracy and complete the records. They ensure that reports are meaningful and can be used to guide decision making. The first task is to ensure that all bank accounts are reconciled. This checks that all cash payments and receipts have been entered into the accounts system and match bank statements. Entries should be made for accruals, prepayments and deferred income or costs. These ensure that reports reflect only transactions that are relevant for the period’s income and expenses. If this is not done then the reports can be misleading. For example, the accounts could include all the sales income for a period, but might not have some of the invoices for the cost of producing the sold items. As a result the profit figures and margins would be too high. Further entries may need to be made for depreciation or amortisation of fixed assets. This allocates part of the cost of those assets to the period. A range of other entries may necessary to complete the closing of the period and guarantee meaningful reports. As a non-accountant I won’t attempt to go into detail! Problem – Time pressure. Time often runs short when closing accounts. Modern software helps ensure that cash transactions are reconciled. But I suspect that many financial reports do not accurately reflect a company’s financial performance in a period. Tip: Use Xero to frequently reconcile bank accounts. End of period reconciliation is then quick and easy. Problem – Complexity. Closing a period can be complex. So it is easy to miss tasks or get them wrong, especially when a business is very active, has international trade or there are exceptional items. Tip: Prepare a checklist of closing tasks to follow at the end of each period. If these 3 steps have all been completed correctly then the accountant can move on the the advisory phase. This is when the time pressure continues to build and further problems can occur. That’s why we are concentrating on this second phase at Numerable. We are aiming to provide tools to help people carry out the necessary tasks quickly and effectively. Take a look at what we are doing at https://www.numerable.io/.